Jordanhill School was again ranked first across a range of key measures published yesterday by Scottish Government on Parentzone. 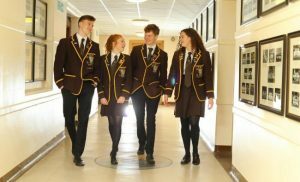 “At Jordanhill we have never set targets for examination results. Direct comparison with other schools is of limited use to any school. Any success we may have reflects our philosophy of supporting and challenging each young person based on their individual strengths and needs. Our teachers, pupil support assistants and others always go the extra mile to understand and help each pupil. Regardless of home background, gender, race, additional support needs or abilities our pupils consistently achieve far beyond what might reasonably be expected. Engaging with parents and helping them to understand how they can best support their child is key to this. The role of parents is core to our work and evident throughout our improvement plans. The data published in The Herald and The Times focuses on a single measure – the % of pupils attaining 5 or more Highers by the time they leave school. However, the school also has the highest percentages at National 5 awards and Advanced Higher. Of greatest significance is the gap between actual performance and the statistical prediction represented by the ‘virtual comparator’. Peformance on all of the other published measures is also extremely encouraging.